Wonderful news! 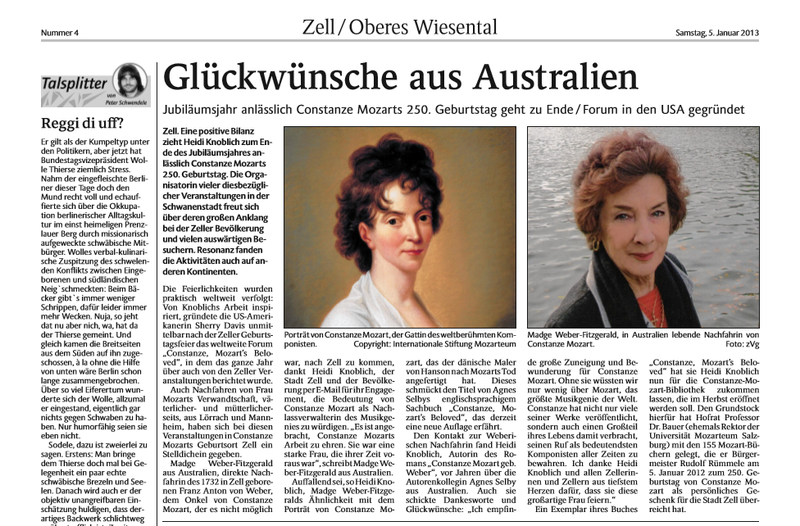 I'm very happy to announce that the forum I created last year for the study and advocacy of Constanze Mozart in honor of her 250th birthday anniversary received recognition in the Badische Zeitung, a newspaper based in Constanze's native region of Freiburg, Germany (Zell im Wiesental). 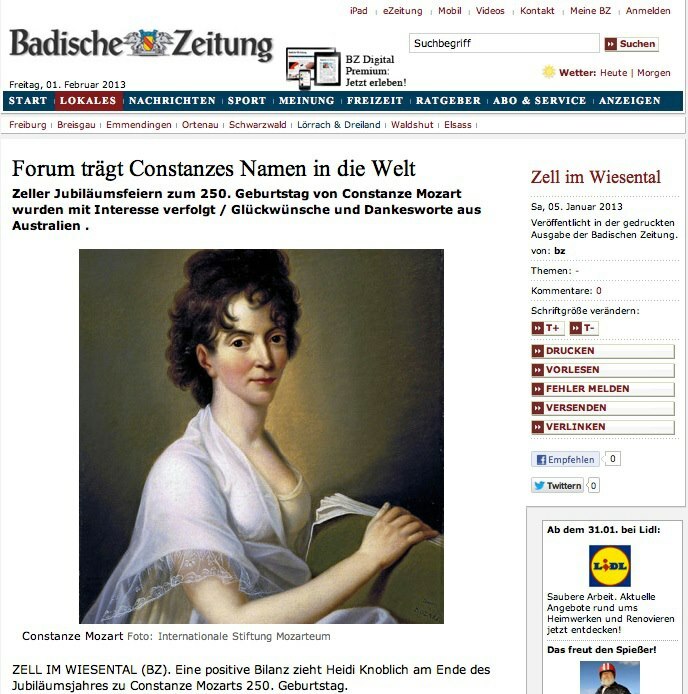 The article from January 5, 2013, "Forum trägt Constanzes Namen in die Welt" ("Forum Carries Constanze’s Name in the World"), was written by Heidi Knoblich, author of Constanze Mozart geboren Weber, who organized the official celebrations in Zell. We were introduced through Agnes Selby on my forum. This recognition is a significant accolade for my work, and a hopeful reward that Constanze's story will be discovered by new and appreciative audiences. "The celebrations of Constanze's 250th birthday were a great success in Zell. The celebrations were followed worldwide by due to the work by Sherry Davis of the USA, entitled Constanze, Mozart's Beloved. The descendants of Constanze from Mannheim and Lorrach also took part in the celebrations but Madge Weber-Fitzgerald could not attend. She is a direct descendant of Constanze's uncle, Franz Anton von Weber and many remarks were made about the amazing similarity between Constanze's portrait and Madge's photo. The remainder of the article stresses the importance of Constanze's role in ensuring that Mozart's work remain available for posterity." I've enclosed two additional versions of the article below. One features Madge and Constanze's images side by side, and without question, they bear a striking resemblance! A photo of Heidi Knoblich and Constanze's descendants in Zell is featured in my article reviewing the year's festivities. 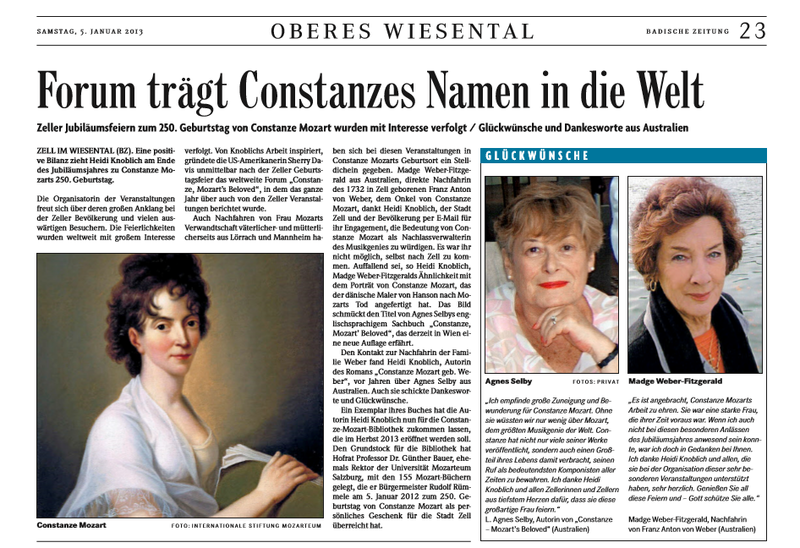 Our combined efforts celebrate the life and work of Constanze Mozart, a pioneer in music business and heritage management. Despite the difficulty of her circumstances as a young penniless widow in 1791, she managed to provide financial security for her two young sons and through 50 years of advocacy, built a foundation upon which her husband's music shall always stand and endure.